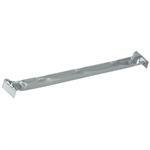 A MUST HAVE ITEM WHEN BUYING THE WARDROBE BOX: We sell both the 18" and 24" wardrobe bar and for online sales. If you're a reseller, we suggest buying the 50 bar case or even the 100 piece option to save even more. Contact us if you need something other than a 5, 10, 15, 25, 50 or 100 piece pack. We distribute thousands of bars a month! Buy with confidence. 18 or 24" wardrobe bar. In a 5, 10, 15, 25, 50 or 100 pack bundles. As master case has 50 bars for both the 18" and 24" bars. If you purchase the 100 pack, you will receive 2 master boxes with 50 bars in each case. Huge discounts offered when buying 500+ bars (for my local buyers). Local pick up at our Riverview, FL., warehouse is optional. Saves huge on freight. WE DO NOT MAKE MONEY ON SHIPPING. WE'RE SORRY THAT SHIPPING COSTS ARE WHERE THEY ARE TODAY. SHIPPING COSTS ARE OUT OF OUR HANDS. This heavy duty bar sits on top of a clothing wardrobe box allowing you to hang clothes just as you would in your closet. When you are packing up your closets, you have a choice of the 18" or" 24 in wardrobe to carry your clothes. 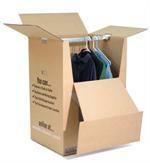 Be sure you buy the correct size bar for the size wardrobe box you will be packing. The 18" bar is used only on the 18" wardrobe box. The 24" bar is used only on the 24" wardrobe box. 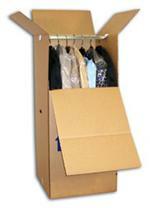 The attached images show how you use the wardrobe bar in a wardrobe box. One image is the bar, and the other shows how to apply the bar. Both the 18 and 24 inch bars are sold in either a 5, 10, 15, 25, 50 (FULL CASE) or 100 (TWO FULL CASE) piece packs.